Two more Connecticut breweries squared off tonight at Backstage restaurant in Torrington for Cask Wars. Half Full Brewing of Stamford brought it strong with its Imperial Cascadian Ale, which it brands as a “double black IPA.” It was fresh and springy, with Citra hops giving a lift to the natural carbonation, which isn’t much. I’m not really a cask guy, or a “real ale” man. But I keep my mind open. Back East Brewing of Bloomfield competed valiantly with its big guns; its imperial stout is one of my favorites. This cask version had a hop kick at the end of each sip which kept it balanced. It was certainly less chocolatey in this form. 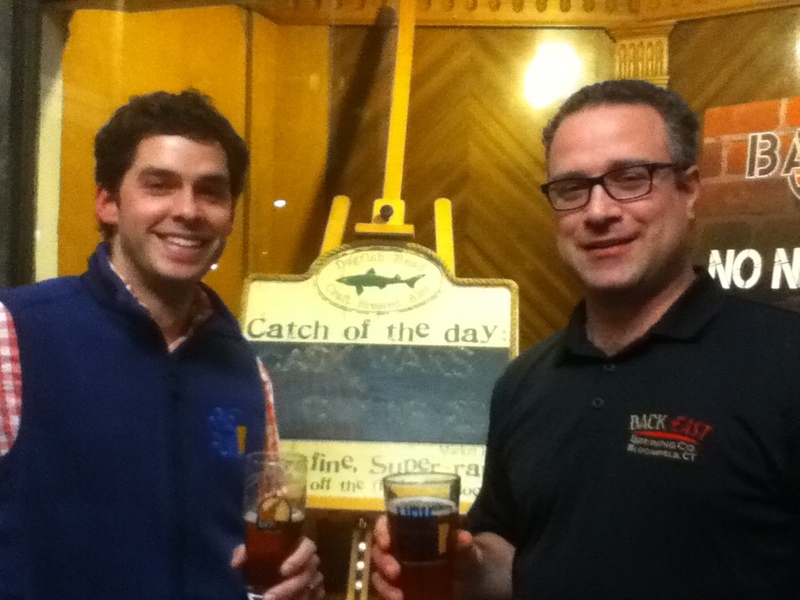 Both owners were in attendance: Conor Horrigan of Half Full and Tony Karlowicz of Back East. They were both educating the rather large crowd, perhaps 70 people or so. The weekly competitions have been a success, in my opinion. I hope it opens up a larger crowd for Connecticut beers in the process. This entry was posted in Beer Snob and tagged Back East Brewing, Backstage, Half Full Brewing. Bookmark the permalink.